These Greenheart workshop stoves are ideal for sheds and workshops and can burn sawdust and wood (most workshop stoves are either dedicated sawdust stoves or dedicated wood burners ). Simply pour a big bag of sawdust into the workshop stove, put a lit piece of newspaper on top and you are away! (we are really impressed with just how good these stoves are for burning sawdust and heating workshops). A good trick is to use a smallish paper bag for the sawdust and then just put the whole bag in. Please avoid burning shavings as they burn at too higher temperature. 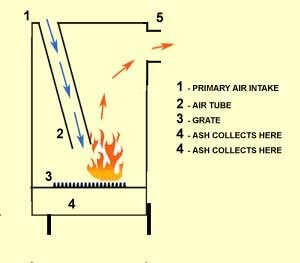 Sawdust burning workshop stoves work because the primary air intake is taken in through a tube that runs from the top of the stove down into the firebox as pictured below. Our Greenheart workshop heater stoves are available to buy online on workshopstoves.co.uk. On Workshopstoves you will also find a full range of workshop stove flue pipe (single skin and insulated) as well as roof flashings, and lots of advice and information.